If you think you know salad rolls, think again! 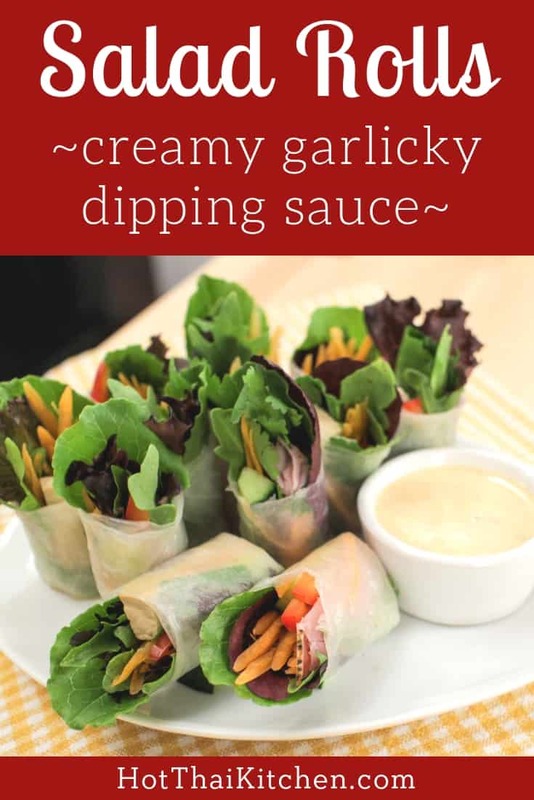 These gorgeous bite-sized Thai salad rolls have become popular in Bangkok in the recent years, and it’s something my mom always brought home for me during my most recent trip home. Keep it vegetarian or use your favourite meat for the filling. Lots of things will work here because the key is really the dipping sauce! This dipping sauce creamy, garlicky, spicy, tart…this is the best thing to dip veggies in! Seriously…this has now become my favourite way to eat salad, and it’s so easy! Amounts not given as it depends on how many kinds of vegetables you want to put in. See video for an idea of the amount of “stuff” in each roll. In a mortar and pestle, pound garlic and chilies into a paste. Add salt, and using a swirling motion, grind the chili garlic paste further until there are no more pieces of chili skin left. Add condensed milk, mayo, and lime juice; stir until combined. Taste and adjust seasoning. Refrigerate while you make the salad rolls. (Note: it is easiest to watch the video for this part.) Cut rice paper in half with scissors, if it cracks around the edges where you cut them, do not worry. Soak rice paper in warm water for about 10 seconds, longer if the water has cooled down. Lay on a clean work surface and let it sit for another 10-15 seconds until it has absorbed all the water around it and the sheet has softened. Fold about 1 inch of the rounded side in towards the center; press the fold gently to flatten it. Gather about 4 leaves of baby greens, picking different colours and shapes, and place them neatly on top of each other. Lay the salad bundle down on the rice paper, about 2 inches above the edge closest to you, and making sure the top of the leaves are sticking out about half an inch over the left side of the paper. Repeat with the another batch of salad greens and place it in the same manner on the right side of the paper. Place other vegetables and protein, but this time you want to center them on the paper. Wrap and roll tightly. Cut each roll in the middle to make 2 pieces. Serve with the dipping sauce. If it needs to sit out for a while, be sure to place plastic wrap over them so they don’t dry out. Enjoy!